With patio season almost here, it’s time to start thinking about your patio furniture and of course your kick-off to summer BBQ bash! We also know buying patio furniture can be a daunting task, with so many options and wanting patio furniture that lasts, how do you choose? Hopefully we can provide a few tips to help you decide what kind of patio furniture works for you and your budget. Today we are discussing aluminum vs. wrought iron patio furniture. Types: Tubular, Cast and Wrought Aluminum. Tubular – Most aluminum furniture is made from hollow tubing, often with internal reinforcing ribs for added strength. The tubing is cut and bent to form the elements of the furniture frame, which are then welded or bolted together by skilled craftsmen. Tubular aluminum is frequently the material of choice for contemporary styling. Over the last few years, finish options in metal furniture have become quite exciting. There are finishes which mimic verdigris, pewter and stone. There are smooth, gleaming finishes, textured matte finishes, single tone finishes, and some with a melange of colors. Not just good-lookers, these finishes are tough. They become a plastic skin that virtually bonds to the aluminum. They will not chip, peel or crack, and are six times thicker than paint, making them highly resistant to weather. Cast Aluminum – Cast aluminum is usually investment furniture. Distinctive and elegant, it features classic designs with roots in the cast-iron stylings of the 18th century.This furniture is produced by pouring molten aluminum into molds and then allowing it to cool. The prototype for each casting mold is hand carved, permitting elaborate detailing. Cast aluminum is undeniably handsome and elegant. While its beauty is striking, its demeanor is classic and understated. Furniture of cast aluminum is often so exquisitely detailed that it seems to have come from a museum. But, like tubular aluminum, it is also amazingly durable and easy to maintain. Quality cast-aluminum furniture can be costly and is not for the family that craves a new look every few seasons. Wrought Iron – Wrought aluminum marries the centuries-old craft of hand forging to the high tech performance of aluminum. Though wrought aluminum cannot duplicate the more intricate wrought-iron stylings, some believe that it represents the ideal wedding of art and technology. With wrought aluminum, you can enjoy the traditional elegance of a wrought-iron look in a material that is lightweight, low maintenance and rustproof. Pros: Heavy, durable, with graceful, flowing designs. (however iron will rust & oxidize over time). Available in handsome designs ranging from contemporary to traditional, iron furniture is so durable that it frequently outlasts its owners. However, if it has not been properly coated by the manufacturer and maintained by the consumer – no ifs, ands or buts – it will rust. 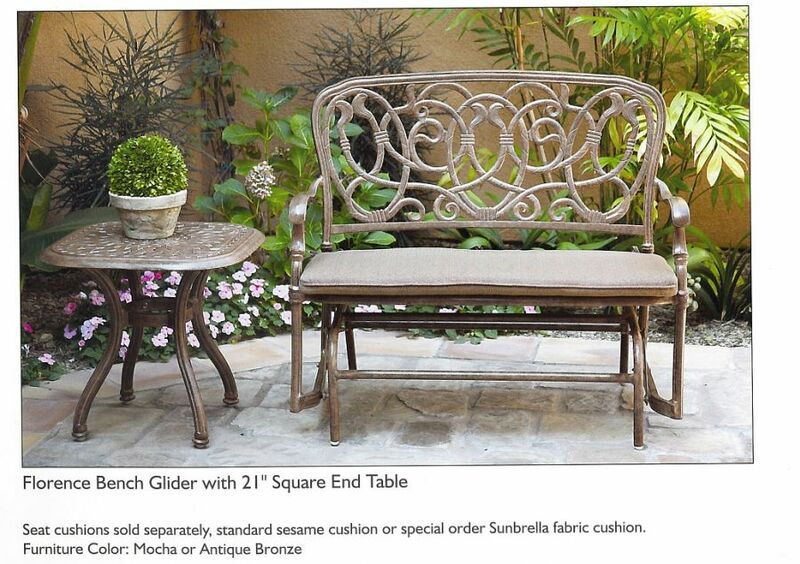 Wrought Iron – Classic wrought-iron styling with its appealing curves and elegant design is hotter than ever. Originally hand-made (wrought) by blacksmiths, wrought-iron furniture is constructed from solid half-inch round bars formed into timeless designs – simple or ornate, the choice is yours. Cast Iron – Cast iron is the essence of romance and nostalgia. Heavy and ornate, it is often identified with the South. Weighing three times more than an identical piece in cast aluminum, cast iron is popular for public areas because it weighs too much to be easily pilfered. 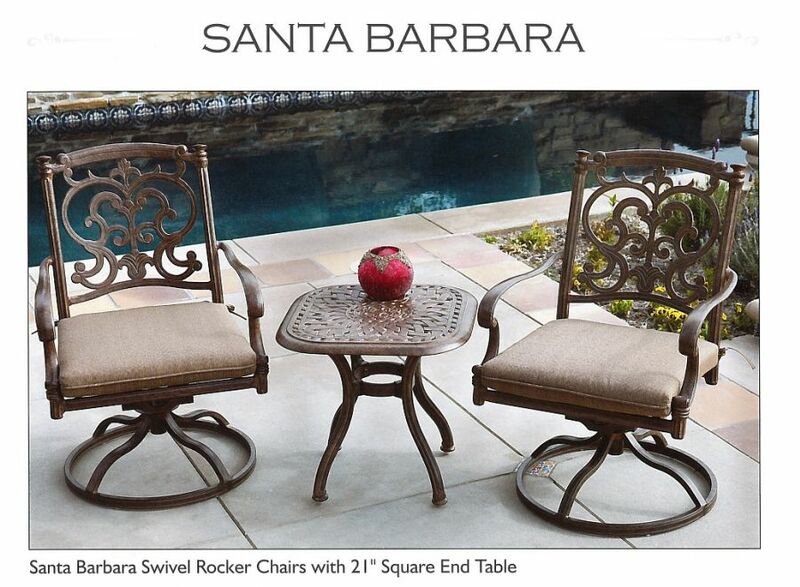 At Real Deal Furniture our metal patio furniture is primarily powdered coated cast aluminum. Taking all the pros and characteristics of cast aluminum there is also an added layer of baked on powder to prolong the life of your patio furniture and ensure it’s ability to withstand the harshness of all weather conditions. Come check them out in our San Diego showroom! « Extended Furniture Warranty Plans…is it Worth the Money? You are currently reading Aluminum vs. Wrought Iron Patio Furniture at Real life, Real friends, Real deal.